John F. Kennedy challenged the world over 50 years ago that if we were going to open the space frontier, then we needed to push our minds: we needed to foster more technology-driven education. 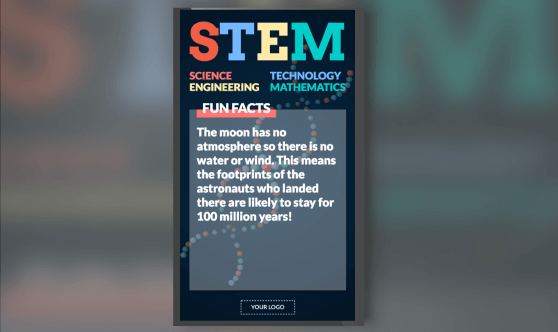 STEM (Science, Technology, Engineering, and Mathematics) education was not started with JFK, but it can certainly be linked back to his challenge. 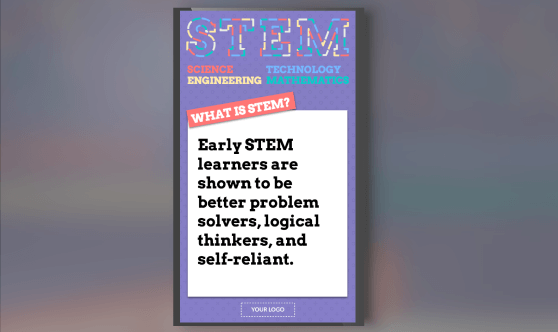 For as widely used as the word STEM may be, many parents are still confused about what it actually is and why it’s important. Our Creative team has made new templates to help educate your audience on why it’s important. They’re the perfect addition to your school office and can be scheduled on a display to go well with some of these other office welcome signs.